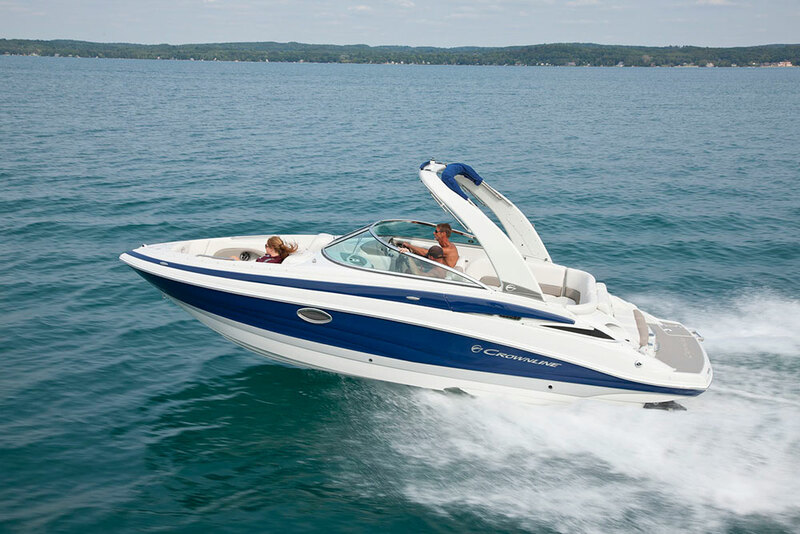 Crownline packs a lot of features into its 285 SS, and this sizeable runabout is bound to make waves in the market. 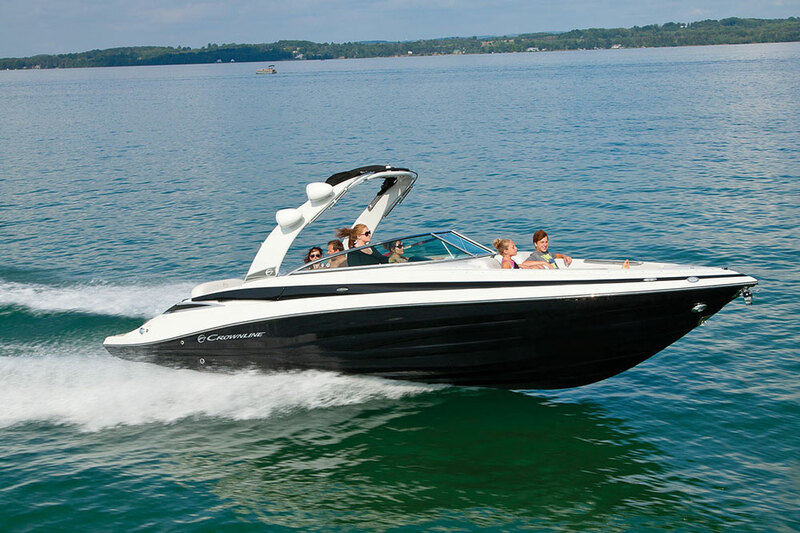 Today’s boat market has a lot of love for the big runabout, especially boats like the new Crownline 285 SS. I have a sneaking suspicion that big runabouts like this remain so popular because they will often prevent a buyer from having to consider a deck boat or (gulp) a pontoon boat. Because they’re large they give the builder the ability to pack in a lot of features, but the conventional hull design keeps them sleek and fun to drive. 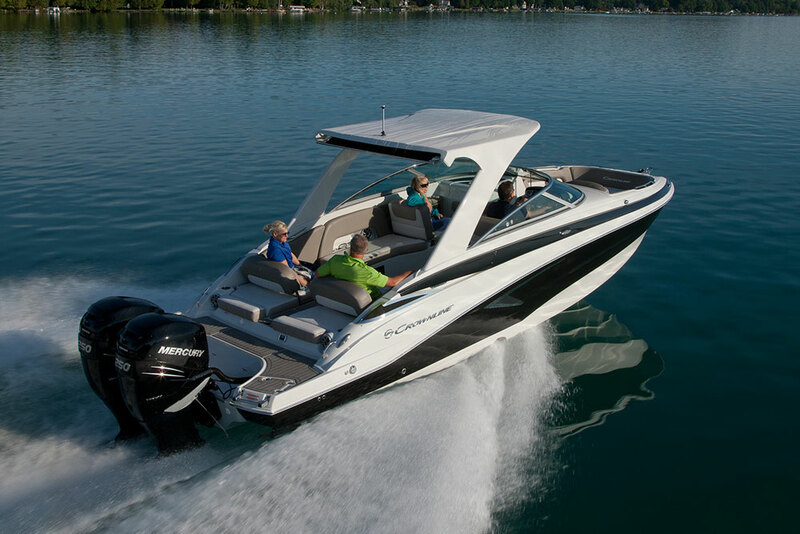 It’s sleek and sporty, but sheer size means the Crownline 285 SS can hold a long list of features while still providing plenty of elbow room. In the cockpit, the centerpiece of the J-shape seating arrangement is the rear lounge, which is electrically operated and adjustable to three positions. I like that the factory used dual actuators, too. That means the lounge is stronger, and offers more reliable and tighter operation. The backrest folds back to form the rear bench, forward to create a rear-facing lounge, and flat to form a sun pad big enough for two adults. Crownline also put the additional cockpit space to good use by including a large head compartment with a sink, cabinet and stowage on the door. The sink spigot doubles as a hand-held shower head, and an electric-flush commode, pump-out fitting and holding tank are standard features. Crownline also fitted the bow with a flush-fitting bow closeout door. That lets you block the chilly evening air on those late night rides back to the ramp. Other cockpit features include a cooler integrated into the starboard seat and self-draining in-deck stowage. You can get a Bimini top, but it’s a $1,270 option. The arches and towers also are optional, but they range in price from $7,000 to $10,000. 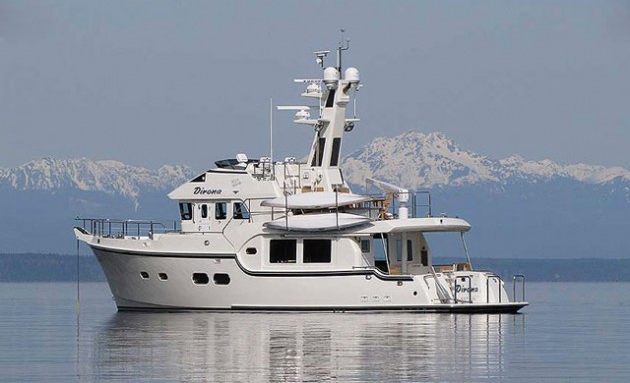 That makes the Bimini look like a bargain, even though we think it should be standard on a boat like this, which MSRP’s for close to $95,000. Of course, the large runabout platform means designers have free reign to create a bow seating area that’s truly luxurious. And the 285 SS delivers. Lounges to either side are sculpted, with gently angled back rests and “hot tub” style design cushions. The armrests pop up, and when not in use they fold down neatly out of the way and look like their part of the backrests. Clever stuff. 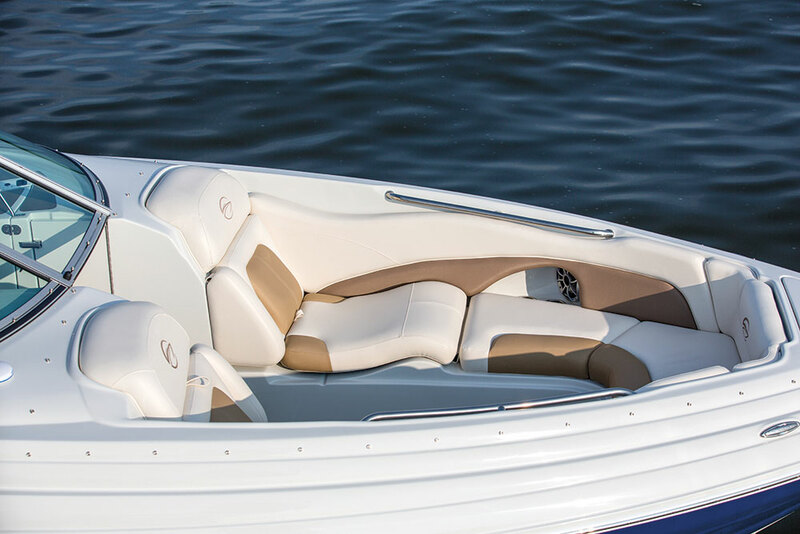 The unusual bow seating on the Crownline 285 SS is as comfortable as it looks. At the aft end of the boat, the swim platform of the boat is generous, deep, and covered with soft SeaDek flooring material. There’s a locker to port with a hand-held shower head, and a four-step telescoping swim ladder to starboard, offset from the drive to keep toes away from the propellers. It’s also nice that there’s a walk-through gate to keep the little ones safely inside while under way. 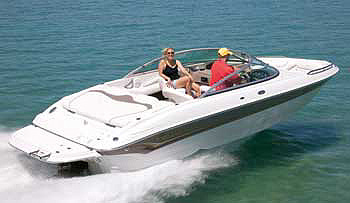 Under the hatch you have four engine choices, all are fitted with the dual-propeller Bravo III drive. 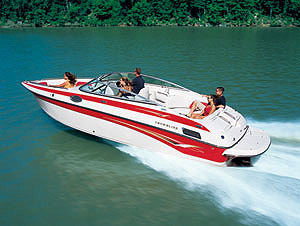 The base engine is a 300-horsepower 6.2L MerCruiser. You also can get an optional 350-horse small block and 380- and 430-horse big blocks. Paired with Crownline’s F.A.S.T. Tab hull design, which features vented reverse chines and a keel pad, even the stock engine should be adequate. It seems clear that Crownline designers were given free reign to create the 285 SS. It’s a big runabout ideal for day-boating with lots of room and features for passengers, yet still manageable for trailering and towing. Best of all, you can forget about those deckboats and pontoons—and instead stick with sleek and sporty. 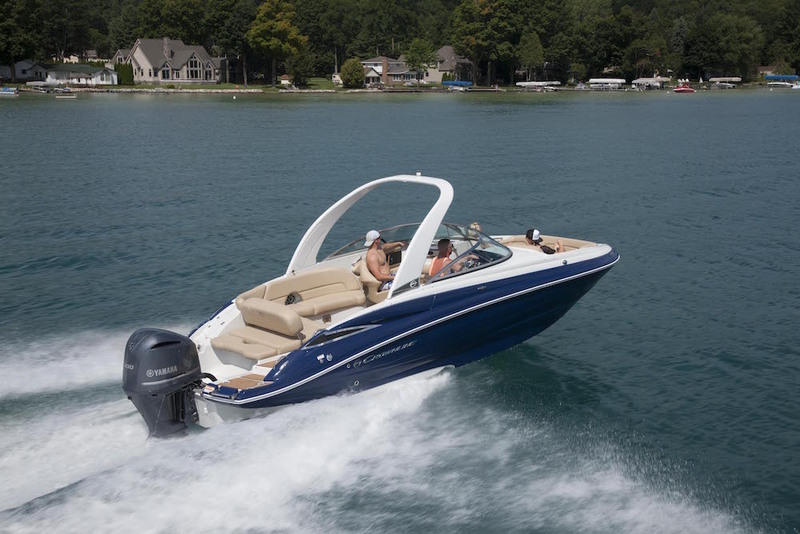 Other Choices: Some other bodacious bowriders include the Sea Ray 280 SLX (which costs more but has another six inches of beam), and the Cobalt R7 (which comes standard with a 320 HP Volvo Penta stern drive). 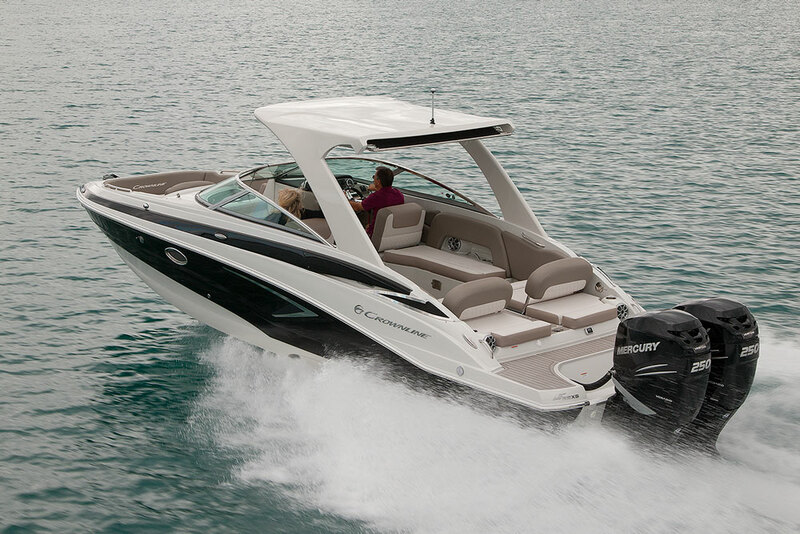 The Rinker Captiva 276 BR provides a less expensive option. For more information, visit Crownline. 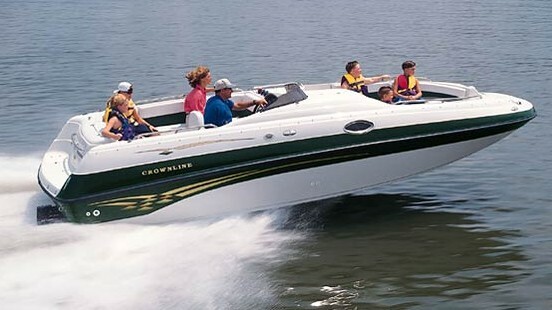 Or, see listings for Crownline 285 SS models currently for sale.